Snips and snails and puppy dog tails, that's what boys are made of. There's another story to the ultrasound too. I used to tell Jan that I have a feeling our child would look like him. But I'd also tell him, I hope he gets his lola's or Tito Roy's nose. You see, Jan's nose is a clan distinction as much as my lips are. His family makes jokes about it. It's actually cute but my brother's nose is pogi, so I definitely don't mind our child having a pogi nose. Jan was not able to go with me to the ultrasound since he had a sudden meeting. When the doctor was scanning, I was getting excited. It was great seeing the baby doing okay. That beautiful heart just beating quick and strong. The idea of a little human growing inside of me is a constant reminder of how amazing and miraculous life is. This little wriggler is part of me! 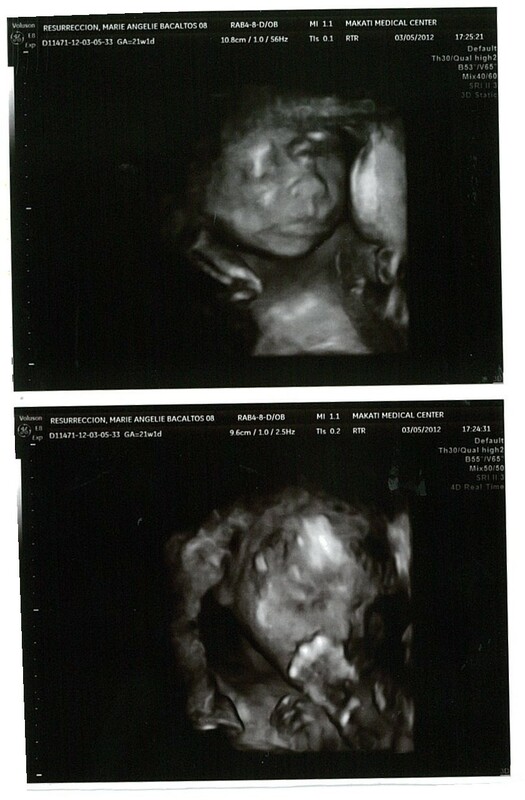 After the doctor informed me of the gender, he zoomed in on the face of the baby.